Let’s say you have a few projects currently running on an ODK-type platform and you would like to switch to another one. This could be for example older forms on Formhub, that you would now migrate to a supported and actively developed platform such as Kobo or ONA, or you may want to transfer data from an offline server (such as Nafundi’s VM) to an online centralized account. How can you accomplish this fairly quickly and ensure that your data travel with your form, without forcing a break and having to keep track of them in 2 different places? Chances are you can accomplish this using Briefcase. Warning: as with any major transfer of data, ensure that you have everything backed-up. Keep copies of your data outside the platforms where you will be performing the migration. Also, as a general rule, you should test the result before you call it a success and start submitting real data – what about filling a test form and trying to submit to your new account before you tell everyone to submit already? You can always delete that test submission once you’re sure that it worked. You should also check that the number of submissions on your new server matches the number of submission on the old one for each form. 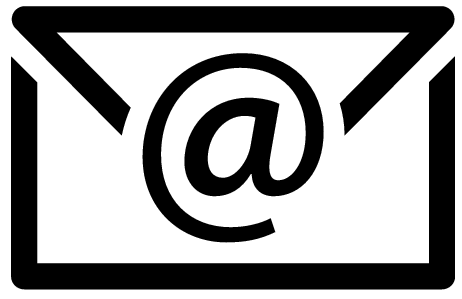 Use Briefcase to download your data locally. If the original server is ONA, Kobo or Formhub, you should retrieve the XLS form definition as well, because Briefcase only deals with the XML form definition, which is harder to edit. 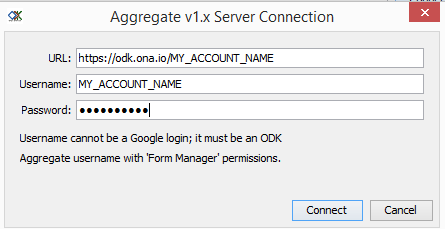 This will be our case for demonstration, however the general procedure would be very similar between other ODK platforms – the only real difference will be the URL you enter in Briefcase when you connect it to your server to pull or push data (and the username/password for each account). 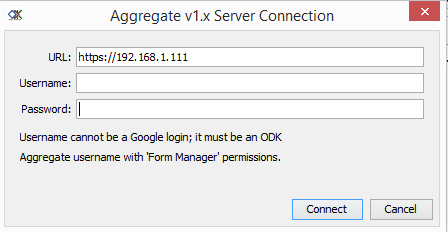 If you are moving to or from Aggregate, however, you would not be able to keep the XLS form definition on the account because Aggregate only works with the XML format. You can then ignore all the steps involving the XLS form below and will have to manage it separately. Hint: you may have to try http or https. Most platforms don’t need a “/” at the end after “MY_ACCOUNT_NAME”. Some will work even if you add one, however others will refuse the connection. Just replace “MY_ACCOUNT_NAME” by your actual username. Figure 3: Our URL to download the form definition with a minimal amount of clicking involved. Figure 4: A successful download on Chrome. You can repeat this with any other forms for which you would like to obtain the XLS form definition. We have no data (the “0” on the right is the number of submissions). We’re now going to push the data using Briefcase on our new account, to this new form definition that currently is empty. We’ll go to the “PUSH” tab, then click “Connect…” but this time enter the credentials and URL of our new account. Then, select the forms you want to push, and click “Push” (bottom right). Figure 7: « Partially successful », but everything we want is there. Depending on how you have setup your users on Aggregate (when you log into the browser to access Aggregate), you may be able to forget username & password. My server I use Nafundi’s odk aggregate VM. And it keeps telling me that the VM does not have IP. How do I access my data otherwise. Well there can be a few reason why this happens. But generally it should be linked to the specific wifi network you are using. For example, are you trying to start the VM on a new network that you have not used before? If so, is it a larger office network? Because sometimes network will have security settings that may prevent the VM from obtaining an IP address (such as 192.168.0.111 or similar) to which you can connect. If not, it may be linked to your computer’s firewall. You may try to temporarily disable your firewall (make sure to start it again after). How to do this depends on your specific computer, but you can certainly find information on this online. I am having challenges with the Sharing option of Kobo tools. Since last week the share icon is inactive and yet I urgently need to share the tool with the data collectors. However, if i share with a username i have every shared with before the Icon activates. Please help urgently. 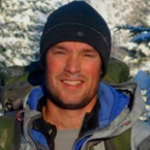 With a background physics engineering, Francis is working as information management at CartONG... when he's not managing reforestation teams in Québec!